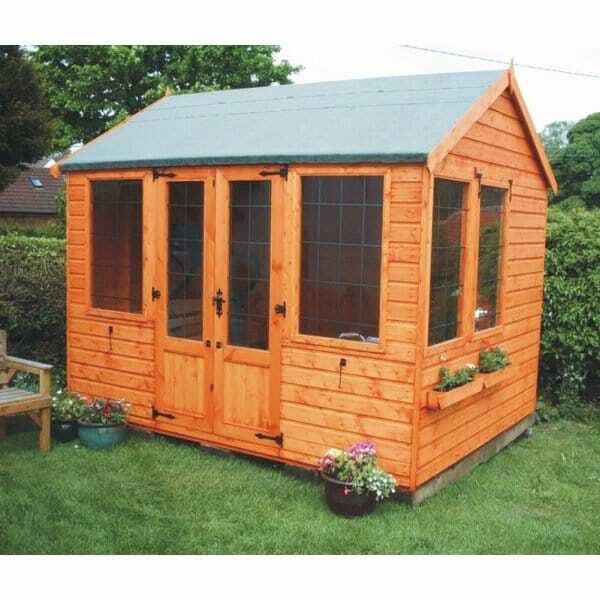 A1 Rutland Summerhouse: 6 x 10 / 8 x 10: The A1 Rutland Summerhouse is a must have garden retreat for your outdoor space this season, if you’re looking for a space to relax or to entertain from, this summerhouse is perfect for you. You can choose from leaded or Georgian style windows, either of which offer a different yet traditional finish. The half boarded French style doors brings a little rustic style to this fabulous summerhouse. The double doors open outwards to help make the most of the internal space, and the two opening side windows outwards to ensure light and air flow. This summerhouse is a welcoming, wonderful place to pursue your hobbies and favourite pastimes in privacy and comfort. A lovely addition to your garden space this year.